Women often want fuller, more sensual lips. Enhancement and/or an increase in lip size is easily achieved using dermal fillers like Restylane or Juvederm. Lips can be made more attractive by putting extra volume directly into the lips, around the edge of the lips (vermilion border) or directly under vertical lines that cause lipstick to bleed. Sometimes, particularly in younger women, we use softer fillers like Restylane Emervel lip or Juvederm Volift to hydrate the lips without making them too much bigger. The best dermal filler product to achieve the desired result will be selected at your appointment. All our dermal fillers contain local anaesthetic. Lip lines are often treated at the same time as a subtle enhancement of lip size to maintain a natural youthful appearance. Botox can also help women with vertical lip lines. Botox works by slightly weakening the muscle around the lips so the muscle doesn’t contract so easily and the lip lines are not so strongly formed. Lips can be many different shapes and sizes. The key to a beautiful lip enhancement result is to maintain appropriate contour and balance between the upper and lower lips and with the rest of the facial features. 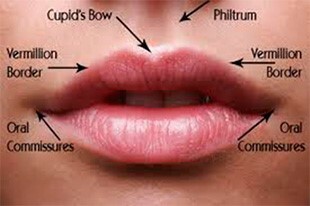 A defined cupids bow and vermillion border is youthful and attractive. Ideally lips have slight upturn at the corners and the lower lip is fuller than the upper lip. New dermal fillers contain very effective local anaesthetic so this combined with numbing cream and ice is usually all that is required to make the procedure comfortable and manageable. We like your lips to look natural and we will treat your lips with this in mind, although some patients do want a fuller or more sensual look which can also be achieved. Some men have thin lips which can make them look older or more severe. Subtle enhancement is very achievable.